While the cost of car leasing and car finance may have fallen over recent years, running a car has seldom been more expensive. Rising fuel prices, road tax, and spiralling insurance costs mean it is as expensive to run a car now as it has ever been, despite great 0 per cent finance and contract hire deals. Now, the government has announced a range of measures designed to keep down the motoring costs. The Independent reports that the moves ‘are the Government’s latest response to protests that Britain’s “squeezed middle” is not feeling the benefit of the slow economic recovery.’ Keep reading to find out more. In a bid to help hard up motorists, the government have announced a range of measures designed to cut the cost of driving. One of the major initiatives announced was to freeze the cost of the MOT test. If you drive your vehicle on a car lease or contract hire agreement then it may not need an MOT test if it is less than three years old. However, older vehicles need an annual test and the government have announced that the maximum price an MOT test centre can charge for inspecting a car is to be frozen at £54.85 until 2015. Ministers said that they had ruled out raising the fee by £4. In addition, the government has announced that road signs will be mounted along motorways to enable motorists to compare petrol and diesel prices and head for the pumps with the cheapest fuel. 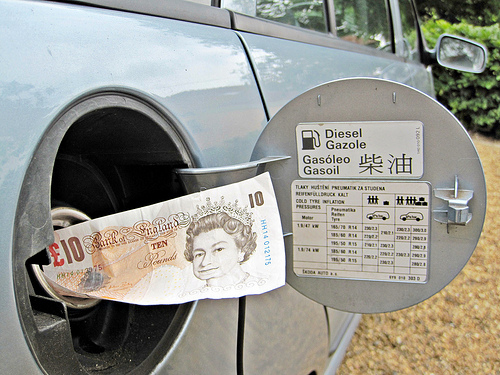 The move, to be piloted next year, comes after the Office of Fair Trading found unleaded petrol was typically 7.5p a litre more expensive on motorway forecourts. Robert Goodwill, the Roads Minister, also said that driving test fees – currently £31 for the theory test, £62 for the practical test and £50 for a provisional licence – are to be reviewed. “The costs of owning and running a car are felt by millions of households and businesses across the nation. The Government is determined to help keep those costs down,” Mr Goodwill said. Justice minister Chris Grayling also announced plans to tackle fraudulent whiplash claims in an attempt to bring down insurance premiums. These measures will be launched next year and will involve claimants being examined by new independent medical panels, replacing the current system of assessments by GPs or doctors employed by insurance companies. As well as a range of measures designed to cut the cost of driving, a report from the Transport Select Committee has called for local authorities to publish annual reports to show how much revenue they raise from parking – and how the money is used. The committee said the Government should also urge councils to implement a five minute ‘grace period’ before traffic wardens issue penalty notices to motorists who exceed the time for which they have paid. This entry was posted in News and Views and tagged MoT, motoring costs, parking costs, Petrol Prices by David Petherick. Bookmark the permalink.